What Makes Combe Martin Special? What Can We Do in Combe Martin? ‍Sunbathe and swim at the beach. Enjoy breathtaking views from Hangman Cliffs. Hunt for crabs in rockpools at low tide. Meet wolves and lions at Combe Martin Wildlife and Dinosaur Park. Spot deer and wild ponies in Exmoor National Park. Delve into centuries of silver mining at Combe Martin Museum. Hike on the Southwest Coast Path. Take the family for a day out at Watermouth Castle and Theme Park. Join the annual Hunting of the Earl of Rone. Shop for fresh produce at the Farmers’ Market. Enjoy a pint of local ale or cider at the Pack of Cards Inn. Book surfing lessons at neigbouring Woolacombe or Croyde. Where Can We Stay in Combe Martin? ‍Book a caravan at John Fowler Holiday Park. Stay in a room at one of the village’s hotels, such as Sandy Cove. Pick a cosy bed and breakfast in the heart of the village. 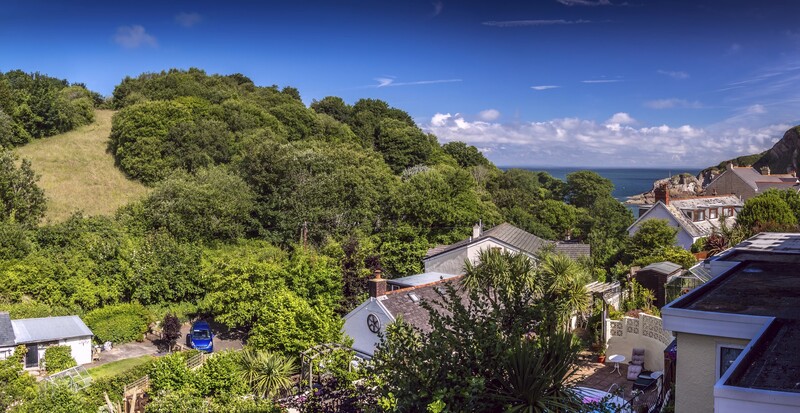 Book a holiday cottage by the beach or above the wooded valley with views of the Atlantic. Combe Martin is a welcoming village on the North Devon coast. It lies in a deep, wooded valley, with a sandy beach, rockpools, clifftop walks and charming independent shops, cafes, pubs and restaurants. Combe Martin is surrounded by some of Devon’s most idyllic countryside on the eastern edge of Exmoor National Park. Its main street winds through the valley towards the ocean for more than two miles and is said to be the longest village street anywhere in the UK. Combe Martin has a rich history of silver mining, fishing and lime-burning, and a variety of unique traditions which are alive and well today. There’s loads to do in and around the village, including swimming and sunbathing on the beach, hunting for crabs in the rockpools at low tide, hiking on Exmoor and surfing at neigbouring Woolacombe or Croyde. Take a wander through Combe Martin and you will discover a variety of striking historic landmarks, such as the red sandstone church, featuring a sanctuary ring which criminals are said to have clutched to save themselves from arrest and imprisonment – as long as they fled the country. Nearby, the Pack of Cards Inn is an unusual castle-like building dating back to the 17th century. It was built with 52 windows – apparently one for every card in a deck to celebrate the owner’s gambling winnings. The main street is home to a range of family-run businesses, including a number of good cafes and groceries where you can pick up everything you need for a day on the beach. Combe Martin’s annual carnival is legendary and concludes with a unique tradition known as the Hunting of the Earl of Rone, during which a hobby horse is chased along the main street by a variety of characters before being thrown into the ocean. The custom was banned in 1837 due to drunken behaviour but was brought back in the Seventies and remains a lively celebration which sees hundreds of revellers parading through the village in weird and wonderful costumes. Follow the main street through the village and you will arrive at the beach, a sheltered cove framed by dramatic cliffs. As the tide drops, a glorious expanse of golden sand is revealed, as well as a walkway which meanders through a maze of rockpools, where hunting for crabs is a popular activity. Combe Martin Beach is perfect for sunbathing and building sandcastles and its calm waters are ideal for a bracing swim in the Atlantic. There are a number of places to eat and drink overlooking the beach, including the Dolphin Inn, where you can watch the sun set on the horizon from a terrace above the sand. Combe Martin is close to many of North Devon’s best family attractions. Watermouth Castle is a couple of miles to the village’s west, featuring Dungeon Labyrinths, Gnome Land, Water Show Extravaganza and Adventure Land. Combe Martin Wildlife and Dinosaur Park is not to be missed, with wolves, lions and amazingly lifelike animatronic dinosaurs – all set within beautiful gardens and woods. Combe Martin lies on the eastern border of Exmoor National Park, an enchanting expanse of windswept moors, ancient woods and tranquil pastureland, where deer and wild ponies roam. The park is crisscrossed with scenic footpaths and scattered with picturesque villages such as Brendon and Simonsbath, where streams trickle past thatched cottages and cosy pubs. Exmoor also has a spectacular coast, with towering cliffs, rocky bays and remote fishing villages. Don’t miss the twin villages of Lynton and Lynmouth, clinging to the sides of a steep valley overlooking a pretty harbour. Combe Martin is a short drive from the beaches of Woolacombe, Croyde and Saunton, where vast stretches of sand are backed by grassy dunes. All three are renowned surf spots and home to surf shops and schools, if you fancy booking a lesson. Ilfracombe is six miles to the west of Combe Martin, with a bustling harbour, art galleries, independent shops and a striking sculpture by Damien Hirst. There is evidence that Combe Martin has been inhabited since the Iron Age, including the neigbouring Newberry Castle fort. ‘Combe’ derives from the Old English ‘Cumb’, meaning wooded valley, while ‘Martin’ comes from the name of the FitzMartin family, feudal barons of Barnstaple from which the manor of Combe was held. The FitzMartins held the barony when Nicholas FitzMartin married Maud de Tracy, who was the heiress of the barony of Barnstaple, until the death of his grandson William III FitzMartin in 1326, when his two sisters became co-heiresses. Combe Martin has a rich silver mining heritage. Silver from the village was used in the creation of a number of items in the Crown Jewels, and a large portion of expenses for the wars of Edward III and Henry V were paid for by selling Combe Martin silver. On the eastern side of the valley, there is evidence of several disused silver mines, including a series of tunnels and a wheelhouse which was once used to lift ore from the mines. In 2008, archaeologists discovered a 12th century industrial complex in Combe Martin. It is believed to be a Monastic Grange with a Hemp Mill and Hemp Pool buried underneath three metres of waste. The discovery has shed new light on the history of the area’s silver mining industry. Combe Martin’s fascinating history of silver mining, lime burning, strawberry growing and fishing can be further explored at the village’s excellent museum. Museum volunteers offer beach safaris, providing visitors with an insight into how the coast has changed over the centuries. How Do You Get to Combe Martin? Exeter is Combe Martin’s nearest airport, with flights to cities across Europe. It is roughly 90 minutes away by car, or by train from Exeter to Barnstaple and a local bus to Combe Martin. Bristol Airport is roughly two hours from Combe Martin and has a greater range of flights. Travellers from outside Europe will generally need to fly to London and hire a car or use public transport to get to Combe Martin. Travellers from western Europe may want to consider taking the ferry, either on foot or with their car, from northern France or Spain to Plymouth, which is approximately two hours from Combe Martin. Combe Martin can be easily reached using public transport. Local buses run regularly between Combe Martin and Barnstaple. Coaches from Bristol, London and Cornwall stop in Barnstaple, which is also connected to Exeter by the Tarka Railway Line. Combe Martin is on the Southwest Coast Path. Approaching from the east, walkers will pass through Lynmouth before embarking on the steep and dramatic approach to Combe Martin. From the east, Ilfracombe, Hele Bay and Watermouth are passed on the way to Combe Martin. Cycling is increasingly popular in North Devon, and with a little planning, long-distance routes which avoid busy roads can be planned. Nearby, the Tarka Trail follows disused railway tracks through some of the region’s most picturesque countryside.